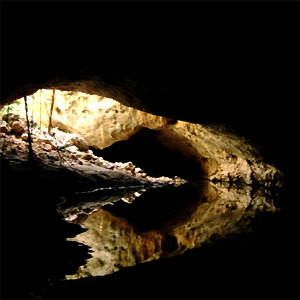 Tunnel Creek National Park is approximately 91 hectares in size and is home to Western Australia's oldest cave system. It is also famous for being a hideout used late last century by an Aboriginal leader known as “Jandamarra” who was killed outside its entrance in 1897. You can walk 750 metres through the tunnel to the other side of Napier Range, wading through several permanent pools and watching for bats and the stalactites that descend from the roof in many places. 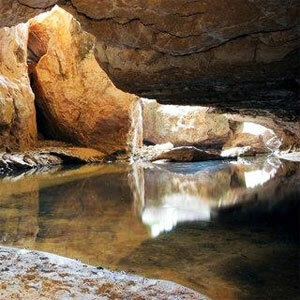 Tunnel Creek National Park is approximately 91 hectares in size and is home to Western Australia's oldest cave system. It is also famous for being a hideout used late last century by an Aboriginal leader known as "Jandamarra" who was killed outside its entrance in 1897. Tunnel Creek flows through a water worn tunnel beneath the limestone of the Napier Range, part of the 375 to 350 million year old Devonian Reef system. 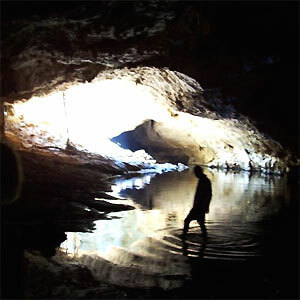 You can walk 750 metres through the tunnel to the other side of Napier Range, wading through several permanent pools and watching for bats and the stalactites that descend from the roof in many places. The tunnel is up to 12 metres high and 15 metres wide in parts. Freshwater crocodiles are occasionally found in the pools. Tunnel Creek was once known as the 'cave of bats'. At least five species of bat are known to use the cave. Near the centre of the cave the roof has collapsed and is a great place to observe the colony of fruit bats. Take a torch, wear closed toe food wear and be prepared to get wet and possibly cold. 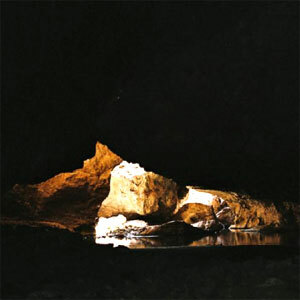 The presence of underground pools along the floors of the cave is due to the water table being just below the present erosion surface. 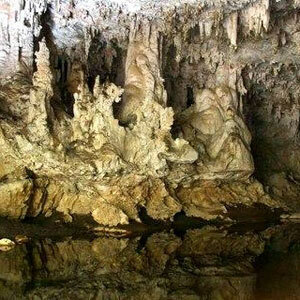 Water only flows through the cave after prolonged heavy rain during the wet season. During the dry season, water dripping from the roof of the caves and onto the floor precipitates calcite to form stalactites and stalagmites, or flows down the walls to form curtains of flowstones. Vegetation in the park consists of Boab and paper bark trees and sand and water goanna, wallaby, bats, herons and owls can be seen. Swimming is possible in the water hole at the entrance to tunnel. Rock climbing in the park is not recommended. 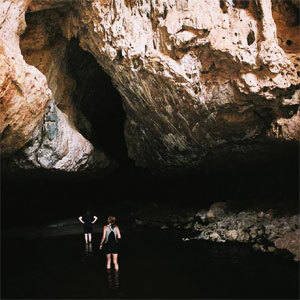 Tunnel Creek National Park is located 115 km from Fitzroy Crossing, 180 km from Derby and 30 km south-east of Windjana Gorge. There are four wheel drive day trips from Derby (subject to numbers). Tunnel Creek is a day use area with facilities limited to toilets and an information shelter. There is no camping and pets are not allowed. There are no rubbish bins so please take your rubbish with you. The best season to visit is between May and September and the park is usually inaccessible during the wet season.